Senior Tour Consultant Marissa explored Kenya and Tanzania on an African safari tour and returned with some great shots of the famous Big Five. Here, she explains the amazing moment behind each picture. Our day in Lake Nakuru began with seeing three white rhinos napping in the grass, way off in the distance. Suddenly a helicopter appeared out of nowhere and the rhinos were running for their lives! Of course, they had nothing to worry about—the helicopter was full of medical personnel trying to tranquilize the rhinos for yearly health checks. The rhinos had eventually run out of sight and we went on photographing birds on the shores of Lake Nakuru, the beautiful white rhinos a distant memory. 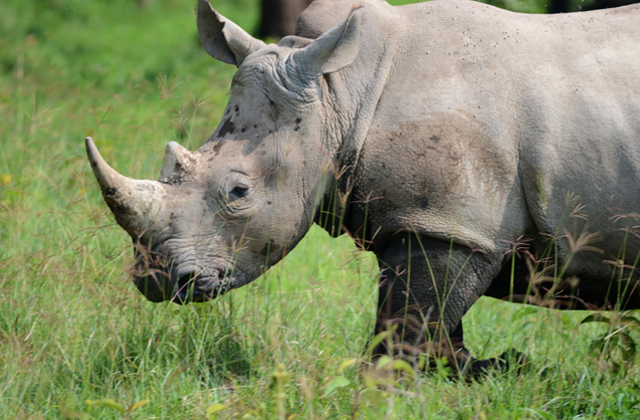 You can imagine our surprise when, suddenly, the rhinos come running by at full speed, inches within our safari van! Thankfully I was able to get this shot before they again disappeared down the road and out of sight. Amboseli National Park is home to the largest elephants in the world. The population of elephants is thriving here and visitors have several opportunities to see these gentle giants up close. Sometimes, you may even get a little guy smiling right at you. 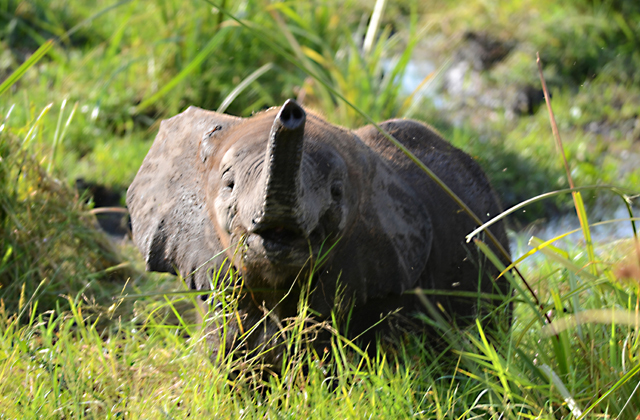 The locals also believe seeing an elephant with its trunk up in the air is good luck! It’s hard to believe the other name for this animal is “widow-maker.” They are known to be one of the most dangerous animals in Africa, right up there with hippos and crocodiles. 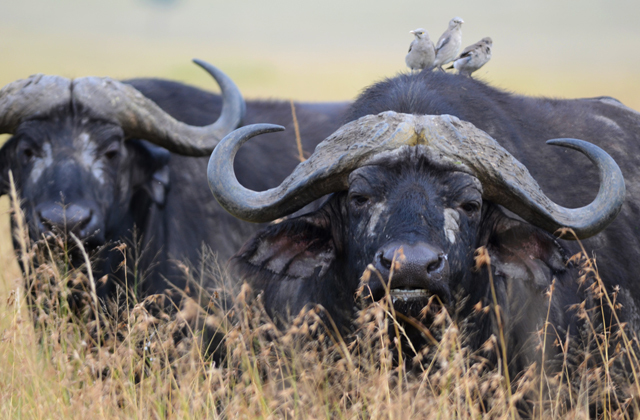 Despite the warnings, the ox-pecker birds, who were kindly eating the parasites off this buffalo in Masai Mara, seem to enjoy their mutually beneficial existence. Ever since I was a little girl, I dreamt of the moment I would see my first “big cat” in Africa. Never in my wildest dreams did I think that the moment would come during a hunt, but this is exactly what my group and I witnessed during our first early evening game drive in Tangire Park, Tanzania! Lions are notoriously lazy during the day, incapacitated by the heat, but at sunset they wake from their slumber—and they are hungry. 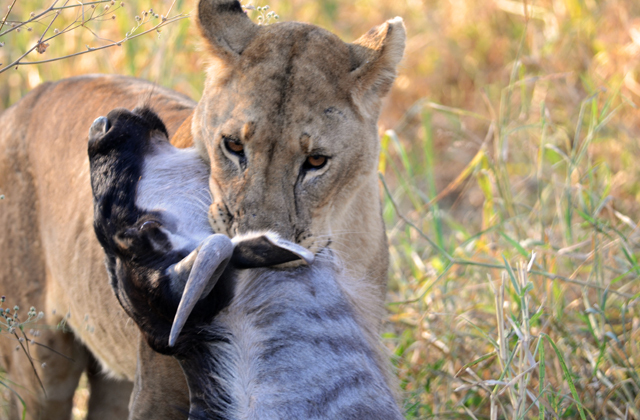 We were lucky enough to watch two lionesses split up a herd of running wildebeest. One lioness grew tired of the audience and decided to hide her wildebeest in the tall grasses just as I was taking this photograph. Soon after, she called her cubs over. It was definitely the most exhilarating experience for our group! The most elusive of the big five, leopards are generally spotted in the beautiful acacia trees during the day. They wait out the heat until the safety of darkness falls and they can begin hunting. 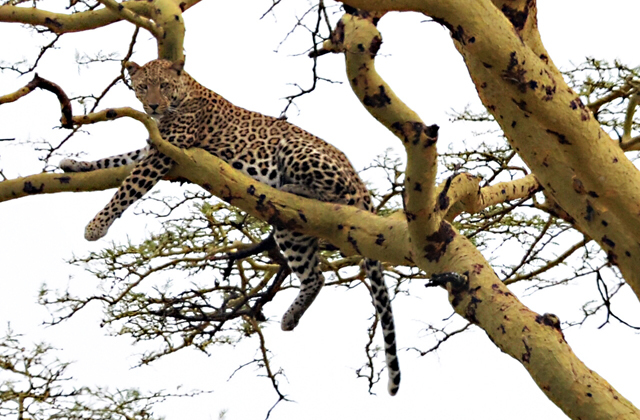 This leopard, who we spotted on our last game drive in the Serengeti, had a good reason for being in this tree, though. Below is a lioness waiting for the chance to hunt this leopard. The pecking order for big cats is as follows; Lions, leopards, cheetahs—so yes, lions can and will hunt leopards! Have you seen the Big Five or been on an African safari? Share you experience in the comments below!